This website is the showcase for the websites that I have designed. I am retired and now design websites to keep my brain working! Take a look some examples on the MY WEBSITES gallery page. They have links to the actual sites (as do the few below). I am now designing MOBILE FRIENDLY websites that automatically display a suitable page size to suit the devices screen width that is being used to view it - whether it be a full sized monitor or a small smartphone. I create website for individuals and small companies who require a modest - but impressive - website. If you want a website designed please contact me to see if I can help. Sophy Osman, ACT (Against Cranfield Turbines) "It looks really great! I think the tabs all work brilliantly and it’s great to be able to click back and forth between them", ". . It is bright and colourful, with a very neat and clear layout and buttons that are easy to follow. It’s a credit to you that we say to people: Just have a look at our website!" 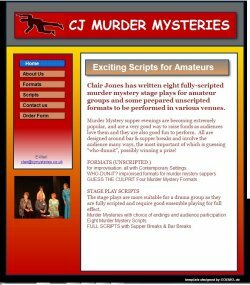 Claire Jones, CJ Murder Mysteries "I am really pleased with the way the site looks"
Mike Coombes, Area Organiser. 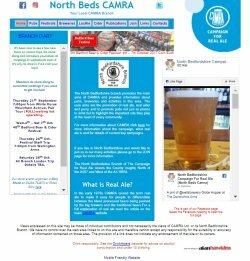 Bedfordshire CAMRA Branches ". . . I think you’ve done an excellent job - highly informative - please keep it up"
This website has been designed with responsive pages - so if you can read this you are using a mobile device, such as a smartphone. A larger page will automatically appear if you view this website on a larger screen. 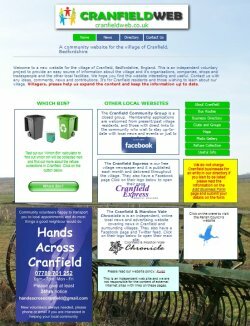 This website has been designed with responsive pages - so if you can read this you are using a device or monitor that can display the full page. A smaller page will automatically appear if you view this website on a smallr screen or smartphone. 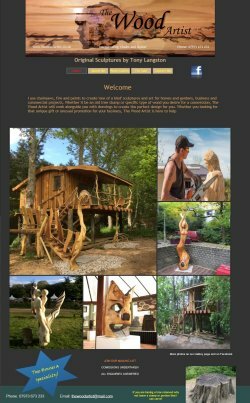 I create website for individuals and small companies who require a modest - but impressive - website for a nominal amount or a donation to charity. If you want a website designed please contact me to see if I can help.